I’ve always liked Plastic Man, ever since he guest-starred on Super Friends back in 1973. Since then, I never understood why he wasn’t a Justice Leaguer, but with the Elongated Man in the mix already, I can understand the redundancy. But he was the first of the stretchable heroes, predating Mr. Fantastic, the Elongated Man and Metamorpho. He faded into obscurity sometime in the 1950s, I guess, along with a lot of other Golden Age greats, and I appreciate that DC has been trying to move him forward in recent years. In the stories I’ve read (both Golden Age reprints and newer ones), Plastic Man has been a full-time super-hero ever since abandoning his criminal career. Eel O’Brian seemed to have never existed, but in the current series, there is a definite duality. Eel is trying to do better, and leave his life of crime behind. But as Plastic Man, his criminal record seems to hold him back. It’s refreshing take, as other criminals, once discovering they had super powers, might have turned to super-villainy, but Eel took the opportunity to turn his life around. 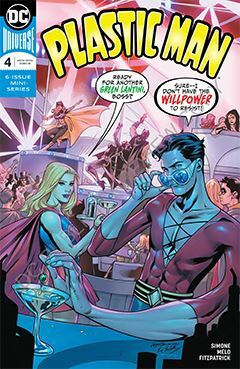 Gail Simone is expanding Plastic Man’s distorted sense of morality. Perhaps it stems from his history of being a not-so-serious super-hero. Back in the ‘40s, he had a comedy relief sidekick in the form of Woozy Winks, whom we have yet to see in this series. Instead, Plas’s sidekick is a young boy, so we may see a blend of the Spirit (another comedic crime fighter) applied here, and that wouldn’t be a bad thing. I like Adriana Melo’s artwork a lot. The line quality is bold and definitive, and lends itself well to simple, bright coloring. No subtle shading, no moody shadows. It all works together to brighten Plastic Man’s world. Certainly the DCU can use the light-heartedness.